Plankton communities normally consist of few abundant and many rare species, yet little is known about the ecological role of rare planktonic eukaryotes. Here we used a 18S ribosomal DNA sequencing approach to investigate the dynamics of rare planktonic eukaryotes, and to explore the co-occurrence patterns of abundant and rare eukaryotic plankton in a subtropical reservoir following a cyanobacterial bloom event. Our results showed that the bloom event significantly altered the eukaryotic plankton community composition and rare plankton diversity without affecting the diversity of abundant plankton. The similarities of both abundant and rare eukaryotic plankton subcommunities significantly declined with the increase in time-lag, but stronger temporal turnover was observed in rare taxa. Further, species turnover of both subcommunities explained a higher percentage of the community variation than species richness. Both deterministic and stochastic processes significantly influenced eukaryotic plankton community assembly, and the stochastic pattern (e.g., ecological drift) was particularly pronounced for rare taxa. Co-occurrence network analysis revealed that keystone taxa mainly belonged to rare species, which may play fundamental roles in network persistence. Importantly, covariations between rare and non-rare taxa were predominantly positive, implying multispecies cooperation might contribute to the stability and resilience of the microbial community. 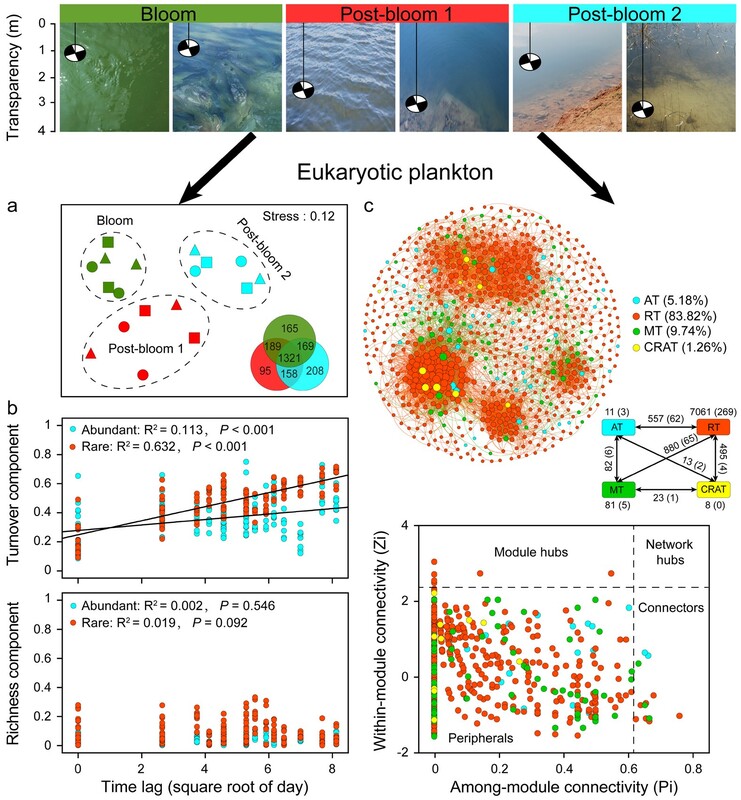 Overall, these findings expand current understanding of the ecological mechanisms and microbial interactions underlying plankton dynamics in changing aquatic ecosystems.